Every 3rd Sunday of the Month from 8:30pm. To beat the January blues, the Running Pump is organizing a great night of fun and culture to celebrate the life of the great bard, Robert Burns. A Haggis, Neeps & Tatties Supper will be available for only £6.95 with a free tot of single malt for those who want it, to raise a toast to the hearty, steaming haggis. Landlady Alison will be reciting Burn’s famous Address to the Haggis and all are invited to share their talents, reciting a poem, singing a song or performing any other entertaining party piece. There will be a fine playlist of Scottish music and Alison will act as caller to give you all a chance to learn and join in a few Scottish Country Dances. So, get your tartan glad rags on and join us for a night of fun and frolics. Runners Up: 4 Pints or 1 Bottle of Wine. 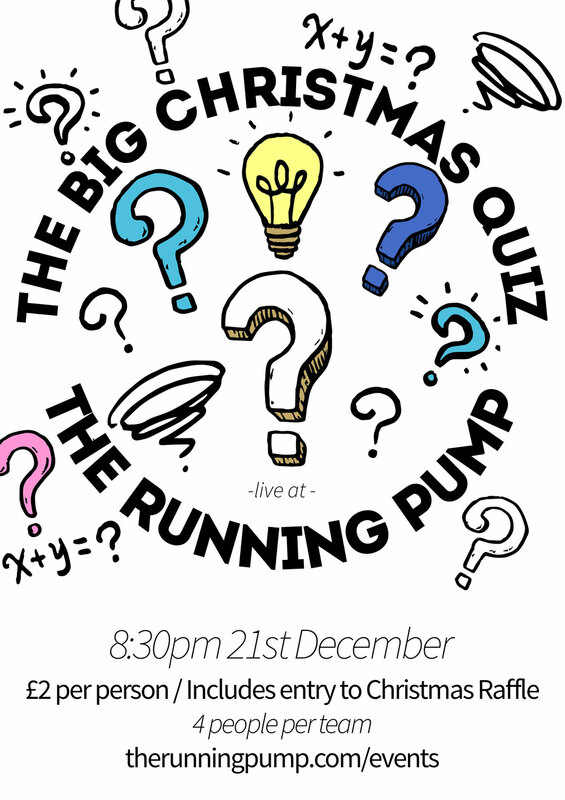 Celebrate 2018 in style at The Running Pump. We have a special 4 course menu running between 6-9pm, live music and our usual great selection of drinks combined with our warm, friendly atmosphere. FREE ENTRY - New Year's Eve Menu requires advance booking - please see below. Our special menu, running between 6-9pm on New Year's Eve 2017. Advance booking and pre-order required. Please visit our bookings page or give us a call to book a table. Click the menu to view in full-screen mode. Price - £39.95 per head. We're proud to be hosting the amazingly talented Hannah Clarke who will be providing you with some truly warming melodies this chilly December. It's FREE entry, so pop along for a beer or book a table and enjoy our freshly prepared food. Why not pop along to The Running Pump on the spookiest night of the year? We will be suppling a host of activities for the youngsters including face painting, pumpkin carving, party games and homemade ghoulish sweet treats. Expect themed music and decor to match. Hotpot Dinner available in addition to a huge selection of great dishes from our country kitchen. Hotpot available at £5.95 per portion. Catforth's Annual Amble will be ending in a field just behind The Running Pump. To celebrate we will be serving juicy beef burgers and sausages from our BBQ. Our main bar will be well-stocked with guest ale, craft beer, lager, cider, wine and spirit. Mouth-watering delights will still be available from our fresh country kitchen. If you plan to dine with us, don't gamble this amble and get your table booked now!